The first thing that caught our eye was the incredible aesthetics behind the design of this website. These guys have really pulled out all the stops to make Thrills.com one of the most beautiful casino sites we’ve seen thus far. But it’s not all about that, is it? That’s why we decided to pop in our own analysis – we wanted to find out whether this casino really does give the “thrills,” or whether it’s just full of, eh, chills? In either case, we promise our reviews are better than our puns! Keep reading on to get the full scoop. Hopefully you’ll get the itch to register an account and check out the more than 700+ casino games and slots this particular online casino has to offer its customers (yea, that’s NOT a type – 700 games folks!). Yeeeeeees – free spins. That’s what it’s all about, isn’t it? We were almost immediately convinced when we saw the new player bonus – it’s a juicy £200 matched – completely free when you deposit the same amount. This means that if you put in £200, you will have a whopping £400 to play with. We’re pretty confident that 100% deposits are pretty much guaranteed money, even if it’s just a small profit. So it’s worth joining just for that. However, we’re getting a little side-tracked here. The bonus we were most enticed by was the 50 free spins as part of the welcome package. The reason we like free spins is that they give you a chance at the big bucks, completely risk-free. 50 free spins will probably result in a bonus round as well, so it’s likely you’ll add a decent amount to your bankroll. 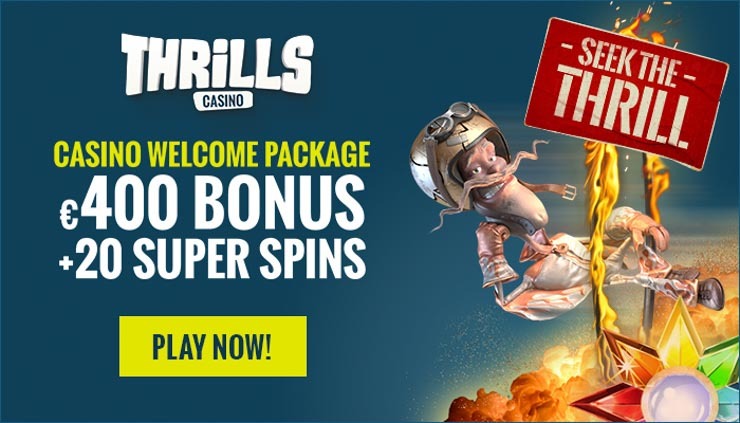 We suggest you join Thrills Casino just because of the bonus that’s on the go here. It’s incredibly generous, particularly when you consider the free spins that they throw in. The promotions for existing players are also quite good, with similar matched bonuses and the odd free spins promotions cropping up here and there. We suggest checking back every once in a while, as new ones keep being added on (and removed) – you need to be on the ball! Is it worth sticking around for the existing player promotions? We’re going to give a resounding “YES” to that one. They’re not the most generous we’ve seen, but good enough to hang around for more. • Dead or Alive – Maybe it has something to do with Django Unchained, but we really love the Western themes right now! • South Park – You’ll have noticed that this is one of our favourite slots. Absolutely love the TV show, nothing’s changed with the slot! The Future for Live Games and Sports Betting? Considering these guys are quite new, there’s no Live Casino nor will you have the opportunity to place a wager on the latest clash between the Miami Heat and Houston Rockets. In fact, we don’t expect these guys to make sports part of the offer anytime soon. However, we expect that they will at some point offer a live casino option, which is quickly becoming one of the more popular features of online casinos these days. Stay tuned! Thrills use the modern ‘Live Chat’ option for its customer service offering. There are no numbers you can call, so it’s either chat or email unfortunately. We didn’t find this to be a massive problem, as we prefer using these methods for contacting CS anyway. The guys who are at the other end of the keyboard definitely know what they’re talking about. They’re not just trained bots – you’re going to get real people that know the games inside out, eradicating the chances of a frustrating customer service experience. Can You Trust New Casinos Like Thrills? This is just a quick entry to dispel any ideas that going for a new name on the market is a dangerous move. You should always do your due diligence and that starts by checking out whether the company is registered with an authoritative body. Thrills.com is, so there’s no problem with that. In addition, you want to make sure that the casino uses a third party for its gaming software. This ensures that all of the odds are set externally, meaning that nothing can be tweaked in favour of the house. Thrills.com does this as well, so you’re guaranteed that your money is safe and that you’re playing in fair conditions. Want to make a withdrawal? You won’t run into any problems. They’re quick and easy and you should see the money in your account in just a matter of days at the most – we had our money ready in less than 24 hours. The guys over at Thrills have placed a huge emphasis on gambling within your limits. While they’re in it to make a profit, they won’t want to turn anyone destitute either. That’s why they’ve made it an option to exclude yourself from gaming – call it a time-out, if you will. You can also choose to set upper daily deposit limits, as well as maximum bets. This means the system won’t let you go beyond these set figures for at least 24 hours. You can even set a maximum period to be logged into the website! After that, you’re locked out. On a technical level, it’s all pretty nifty! Join up, that’s our advice! Thrills are new to the market, so they’re in a major promotional stage right now. That’s a good for you as the consumer, as it means the bonus offers they’ve got going are as good as they’re going to get. The guys look like a fun bunch as well – just check out the ‘about’ section of the website. The company is obviously quite new, which explains the fresh and modern look about the place. We certainly understand the buzz that’s going around concerning Thrills, as we found it definitely lives up to the billing!